Curl up on the sofa, under the duvet or on a beanbag with a good book, magazine or comic. Remember that re-reading a book several times really builds confidence and fluency. 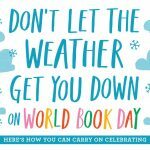 Challenge your child to become an ‘expert’ and read their book (or part of a longer book) to as many different people or in as many different places as they can! Get snapping! We would love children to bring in their photographs showing us what they have been up to during the snow days. These will be used in class for speaking and listening as well as a writing stimulus. These can be printed or emailed to your class teacher. What can you do to stop a snowball from melting? 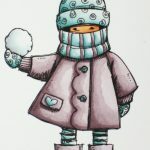 Challenge your children to make a set of snowballs and then think about what they could do differently to each one in an attempt to stop them from melting. 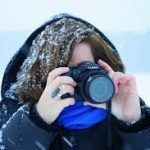 TIP – don’t make them too, too big! Children could they record their results in any way they wish, but some suggestions are using annotated photos, making a video clip, drawing pictures or writing down what happened. You could help them draw a simple table with one column stating what they did to the snowball and another column either saying how long it stayed frozen or recording its size after a set period of time. We would love to hear about what you found out! 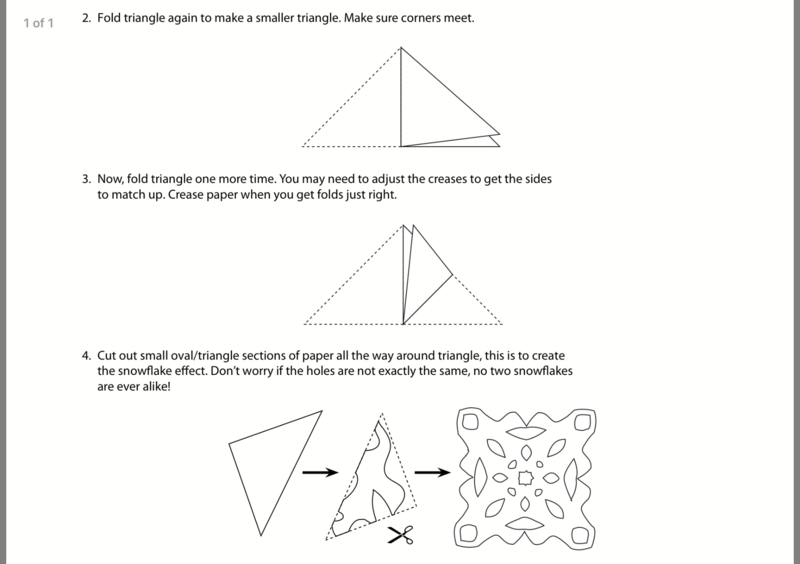 You could introduce this to your child by folding paper shapes into half and then again into quarters, counting how many sections there are when you fold the paper open again. We look forward to seeing everyone back at school once the weather improves. Until then, wrap up warm and enjoy the snow! If you are looking for something to keep your child busy when they aren’t playing in the snow then you might like to try an app called Teach Your Monster to Read. It is free until this Sunday (usually £5.99) and a great one to download to help support phonics and reading! It begins with single letter recognition and works right up to reading sentences. FREE Teach Your Monster to Read app! We hope you are all looking forward to half term next week. If you have any pictures that you could bring in of somewhere that you have been in Guernsey or if you have been away to share when you get back that would be wonderful and we can put them up on our Guernsey and World maps in the classroom. Please remember that on Wednesday 7th March at 7pm we have an e-safety information evening run by Matthew Parker. It would be great to see you there as I’m sure it will give you lots of information about how to keep your children safe online. The children have loved having a go at making spinners in school and seeing what they can do to keep them in the air the longest. They also had a chance to see who had made the best spinner in assembly too which added to the excitement. The children will come home with a letter explaining how you can make spinners at home and see if they can improve on what they have already made. They will also come home with a template that you can use too. This is an optional challenge, but if you have a go we would love to see how you get on! We will be continuing with looking at Goldilocks and the Three Bears. The children are reciting this story most days and have been taught signs to help with remembering the story too. 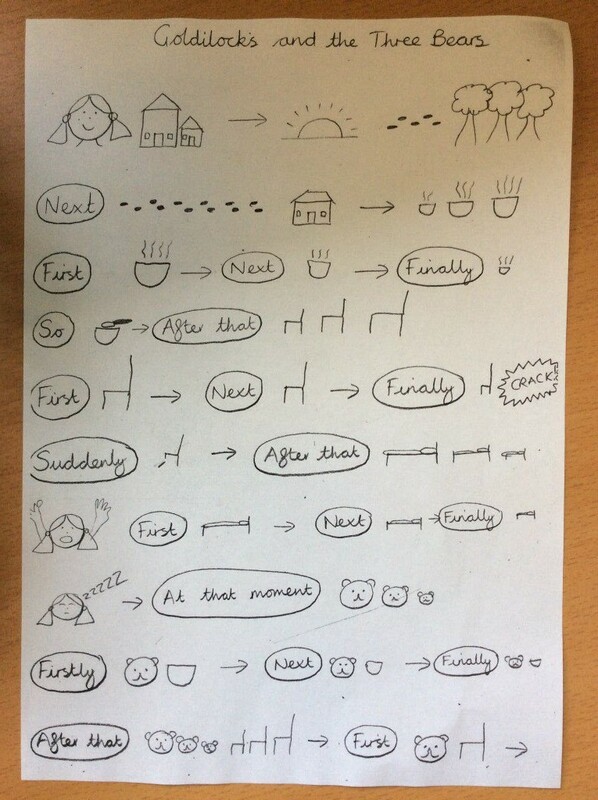 We have learnt actions to go with the words ‘early one morning, so, but, after that, first, next, first, who, at that moment, suddenly & finally.’ The children are doing a fabulous job at using these so they may like to show you themselves. This week we will be looking at making amounts of money. The children have already been trying some of this using their real money in the Discovery Zone and doing a wonderful job. We will also move onto giving change too. Over the last few weeks we have been having a lot of left over fruit after each break time which has been tricky to send back home because they aren’t named. Please could we ask that fruit is named either on the skin (for things like bananas) or put into a named tub so that if it is not eaten it can be taken back home and reduce the amount being thrown out. The children all looked fabulous dressed up as different book characters today and we enjoyed hearing about their favourite stories. As part of the whole school science focus next week, each class will be looking at paper spinners and children will be challenged to investigate different sizes and shapes to see which one stays in the air the longest. More details will be sent home next week if your child would like to continue this investigation at home. In Literacy next week we will be continuing our work on Goldilocks and the Three Bears. 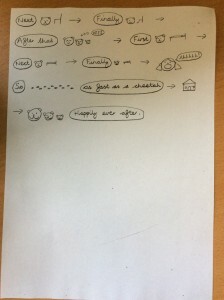 The children are learning to re-tell the story using a story map and actions to help. 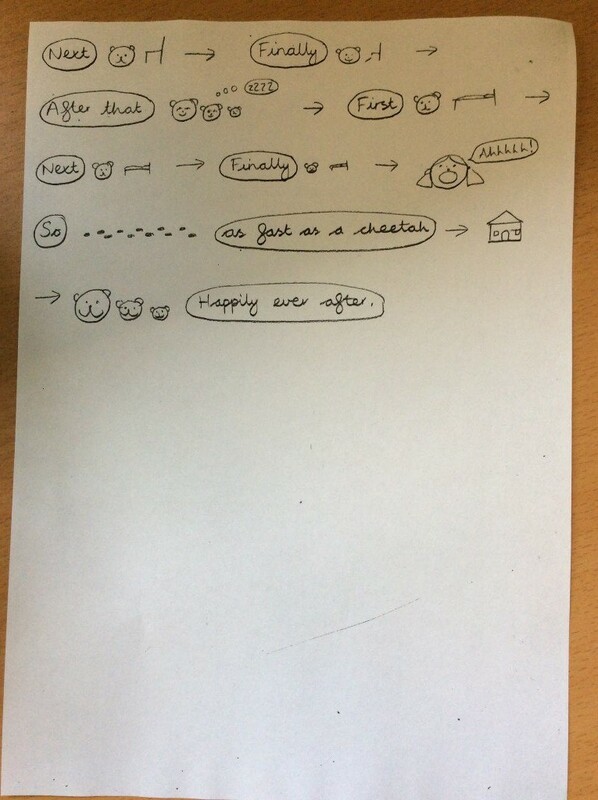 The story map is below if your child would like to use it to re-tell you the story at home. We will also be doing some sentence work based on the story. In maths next week the children will be using their addition and subtraction skills to help them solve word problems. If your child has worn spare uniform home and you haven’t returned it yet, please could it be returned to school as soon as possible because we are very low on spare clothes and with the wet weather, we are finding that we are needing them more often than usual. Today the author David Lucas came to visit us as part of Book Week. 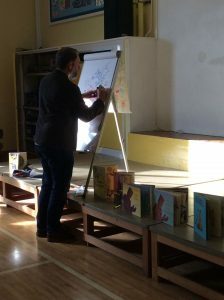 He read the story of ‘Grendel – A Cautionary Tale about Chocolate’ and then taught the children how to draw Grendel using simple shapes. 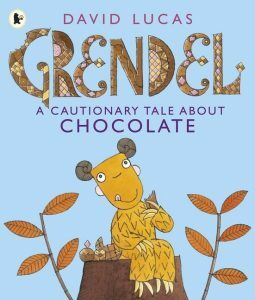 The children thought about what they might wish for if they were given three wishes like Grendel in the story. David then showed the children how they can create their own imaginative story characters using combinations of words e.g. an ice and fire dragon, a robot tiger or a class princess. The children have brought their drawings and ideas home with them and David has challenged them to continue working on these. If they develop their characters further or use their ideas to write a story it would be great to share these in class. Just a reminder that on Friday it is dressing up day and we will be holding our second hand book sale. Any book donations will be gratefully received tomorrow or Friday and books will be on sale for 50p each. It was lovely to see some of you on our Discovery Zone open afternoons. We hope that you enjoyed sharing some learning with your child; they certainly liked showing you what they get up to! We shall be beginning a new Talk for Writing unit on Goldilocks and the Three Bears. 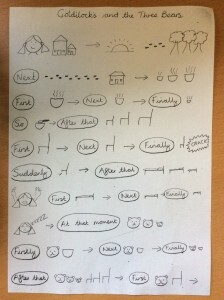 The children will be learning the text using a story map and actions. Just a reminder that this week we are running the Readathon sponsored read. On Wednesday afternoon we shall be having a visit from author David Lucas. On Friday children are invited to dress up as a character from a book. We shall then be talking and writing about their characters in our literacy lesson. Children can also bring in any old books to donate to our book sale along with 50p to buy a book if they wish.